WLC doesn’t assume any prior knowledge of apologetics, and provides handy pull out quote boxes to simplify and explain major concepts. This is nice because many apologetic books either assume a working knowledge or have trouble engaging the everyday reader. He uses historic vignettes to introduce the reader to key thought leaders throughout the book. His logic is steely and his prose is spartan, but he moves deftly through 10 major apologetic topics, equipping the reader to think well about such areas as: atheism, meaning, basis for ethics, problem of evil, the plausibility of the resurrection, and the exclusivity of Christ. These chapters are introductory and do not cover all the objections that could be raised on a given topic. For existence, in the chapter on “Why there is something rather than nothing”, he argues by deduction for the existence of an uncaused, unembodied Mind that transcends space and time, and then makes a leap to call that thing “God.” Could that thing not be an infinite and intelligent version of the president of the United States that we haven’t yet met? What makes that thing God? Moreover, how do we get from there to Jesus? WLC builds his case for Christ as the Son of God in the later chapters, weaving in his personal story of skepticism and faith. 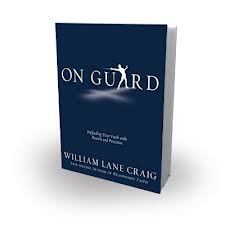 What On Guard lacks in warmth, it makes up for in clarity. This is not a devotional book; it is a introduction to evidential apologetics, and a fine one at that.